JSerra Catholic High School’s Theater Department have been nominated by the South Coast Reparatory to perform in Scotland. JSerra was chosen to participate after a rigorous selection process involving a review by the American High School Theatre Festival’s Board of Advisors and a group of renowned college theatre professionals. “I am so thrilled that our students have been given this opportunity to showcase their talents on a larger, global stage. 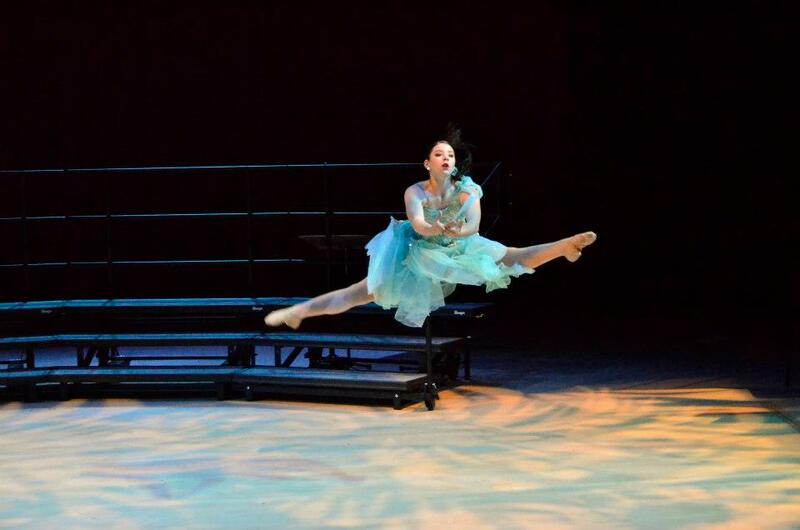 I am very proud of Deborah Marley, our students and our department,” said JSerra Fine Arts Director Nancy Harrell. Scotland’s capital, Edinburgh plays host to the largest arts festival in the world. The Fringe Festival, which takes place every August for three weeks, features performances from around the globe. “To be recognized by the American High School Theatre Festival in my first year with JSerra is a great honor. I have been blessed by a very talented and dedicated group of students who invest so much into their work. It truly is a pleasure to instruct and direct them,” said JSerra Theatre Director Deborah Marley. “We have the chance to bring our work to the world stage is beyond any of our imaginations. The JSerra actors will get a once in a life time chance to perform in front of thousands of people and take part in the best theatre festival in the world. 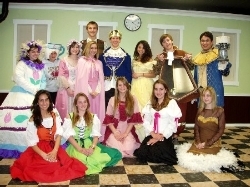 The students will travel to Scotland in August of 2014 to perform a play of their choice, on the world stage at The Fringe Festival. The theatre department is currently performing Alice in Wonderland in the JSerra Black Box Theatre. Performance dates are May 10-12, tickets may be purchased at the cashier’s office. The America High School Theatre Festival (AHSTF) nominates JSerra Catholic High School’s production of Agatha Christie’s The Mousetrap for The Fringe Theater summer performances. 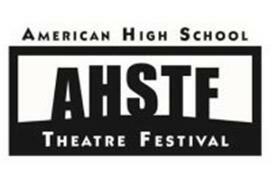 Out of thousands of applications, the AHSTF annually chooses only ten high schools in the country to compete in the prestigious Festival. “I am thrilled to have our wonderful production of The Mousetrap and the theater program here at JSerra recognized for our work. I am incredibly proud of the student actors who commit so much of their time and sacrifice so much to be involved in a production. It is rewarding to see all of our hard work and dedication be honored,” said Deborah Marley, JSerra Theater Director. The high school with the winning performance from the festival will move on to perform in Edinburgh, Scotland, at The Fringe Festival. The group that moves on to Scotland will have the opportunity to perform a play of their choice four times on the main stages. The group will also take professional masters classes while in Scotland. The premier festival attracts professional actors and theater companies alike. “JSerra is honored to be acknowledged by this wonderful organization. I am so happy that our students’ efforts and hard work, and that of our theater teacher Deb Marley, have been given recognition through this great opportunity in Theater Arts,” said Nancy Harrell, JSerra Artist-in-Residence Director. The Artist In Residence program hosted their annual Winter Showcase at SOKA University this February. The showcase highlighted many of the 750 students that participate in the arts. The audience of over 600 was enthusiastic in receiving the performances, and helped make the evening a great success. The student performances were classic, fun, experimental, and emotional. Performances included everything from classical ballet pieces performed using New York Ballet choreography, to the choir ending the evening with a beautiful rendition of ‘The Lord Bless you and Keep You,’ while dancers performed a sacred dance piece to the music. Choir also brought down the house with their version of Fun’s ‘Some Nights’. Instrumental music showed off their abilities with our string ensemble and our steel drum band bringing the audience to their feet. The theater department opened the show with ‘There’s No Business Like Show Business,’ and concluded with a stage combat scene from Romeo and Juliet. Visual Arts and Broadcast Journalism students were well represented with a visual arts show and reception in the lobby before the performances began. Broadcast Journalism presented a wonderful piece showing the best of The Lion Report, which showed the tremendous growth our students have experienced this year with the implementation of our new Broadcast Journalism program. The evening highlighted what a presence the visual and performing arts have on campus, and it continues to grow. View the album from the night’s performances on Facebook. “Three blind mice, three blind mice. See how they run, see how they run.” The nursery rhyme takes on a much darker meaning in “The Mousetrap” than good old Mother Goose intended. 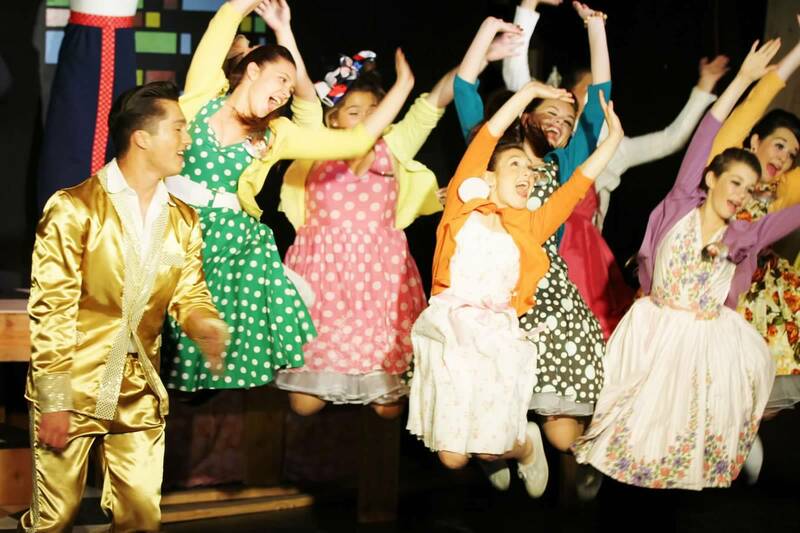 People, not mice run for their lives in JSerra Catholic High School’s ode to the classic show. Since opening in 1952 in London’s West End, Agatha Christie’s mystery thriller has been entertaining audiences for sixty years. With more than 23,000 performances, it is the longest running show of all time. Despite its longevity, the show has kept its allure of mystery. It keeps its twist ending a secret from all but those who have seen it, by keeping the show out of print. Audience members get to enjoy it for all it is worth when they see it for the first time. As authentic as the costume and make-up designs are, the true success of a show depends on the actors’ performances and this cast does not disappoint. The bright-eyed Mollie Ralston (Kallin Zahren) plays her part admirably through her believable sentimentality toward the chaotic Christopher Wren (Ryan Najjar) and her loud cries into the second act. To read the complete review click here. Congratulations to Donna Magnani-Convertino and the entire cast and crew for the success of Bye Bye Birdie. A cast of 27 students and nine stage crew members, all of whom shined and contributed 100 percent to making Bye Bye Birdie a memorable production. With nine sold out performances, Bye Bye Birdie received a nomination for Best Featured Actress in a Musical from the Cappie Awards is Nika Convertino. JSerra also received 14 Critics Choice nominations including; Sharon Tangolics, Brendan Lank, Troy Janikowski, Gianna Meaglia, Nick Schulz, Shannon Conboy, and Zachary Johnson. Other categories of nominations are; best ensemble in a musical, best musical, and best crew team. Brendan Lank, Gianna Meaglia and Nika Convertino were also chosen to perform at the Segerstroms Center Main Stage. Posted in Academics, Awards, Education, Events, Family, Fine Arts, JSerra, JSerra Catholic High School, Music, News coverage, Teachers, The Pride, Theater, UncategorizedTagged Brendan Lank, Bye Bye Birdie, Cappie Awards, Donna Magnani-Convertino, Gianna Meaglia, JSerra, JSerra Theater, Nick Schulz, Nika Convertino, Shannon Conboy, Sharon Tangolics, Troy Janikowski, Zachary Johnson. He’s here! He’s here! Conrad Birdie is here! Donna Convertino and her dedicated cast and crew have produced an outstanding rendition of Michael Stewart’s “Bye Bye Birdie”. 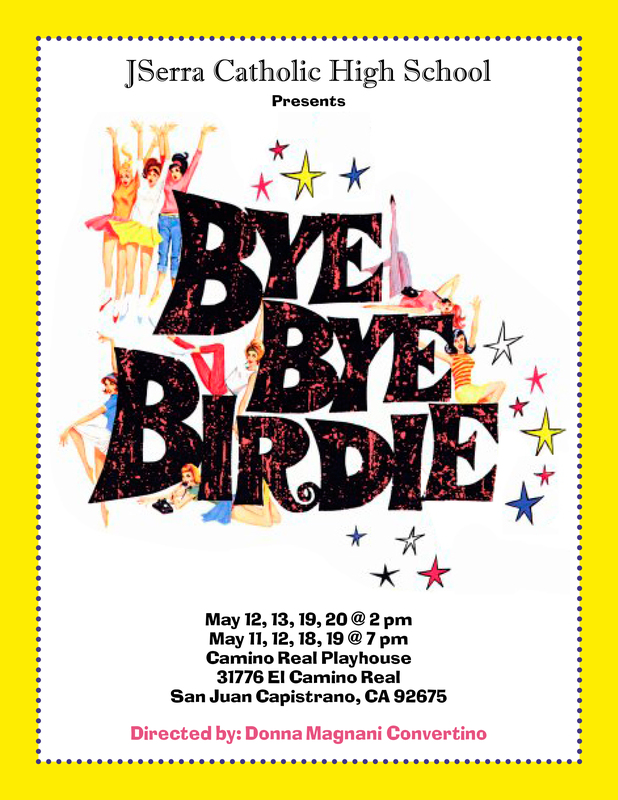 After countless hours of rehearsal, vocal coaching, and preparation, the highly-talented students of the JSerra Theatre Department are dazzling on stage at the Camino Real Playhouse in downtown San Juan Capistrano. Standout performances include Brendan Lank as Albert Peterson, Giana Meaglia as Rosie Alvarez, Sharon Tengolics as Mae Peterson and Troy Janikowski as Conrad Birdie. Shows run May 11, 12, 18, 19 at 7 p.m. and May 12, 13, 19, and 20 at 2 p.m. Tickets are available at the Cashier’s office-students/seniors/military $12 and adults $15. Click here to watch the Lion Report.